At Chambok, we cater for individuals, small groups and even large groups of 100 or more. Take a look at the things you can do and our sample itineraries. Scroll down to see more details about how to get here and a map of our exact location. For group bookings, check out our Tour Groups page for more information. To arrange your visit, just give us a call (see below), let us know what you are interested in, and when you’d like to come. We just need at least two days advance notice. Chambok is located in Kampong Spue province, Chambok commune, Phnom Srouch district and travelling with national road 4, by spent 2 hours from Phnom Penh to Chambok you can travel by mini van, or by bus. We can arrange for a local driver to collect you from your hotel in Phnom Pehn or Sihanoukville and take you directly to Chambok. A cheaper option might be to come by bus. Many buses run between Phnom Pehn and Sihanoukville, with several departing each hour, many also have air-conditioning. Most hotels will help you book a ticket, say you want to be dropped at Treng Trayueng town (and let the bus driver know too). 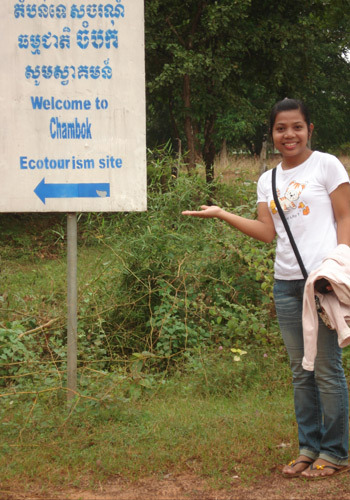 If we know when you are coming, we can arrange for a local driver to bring you, that remaining around 20km to Chambok.